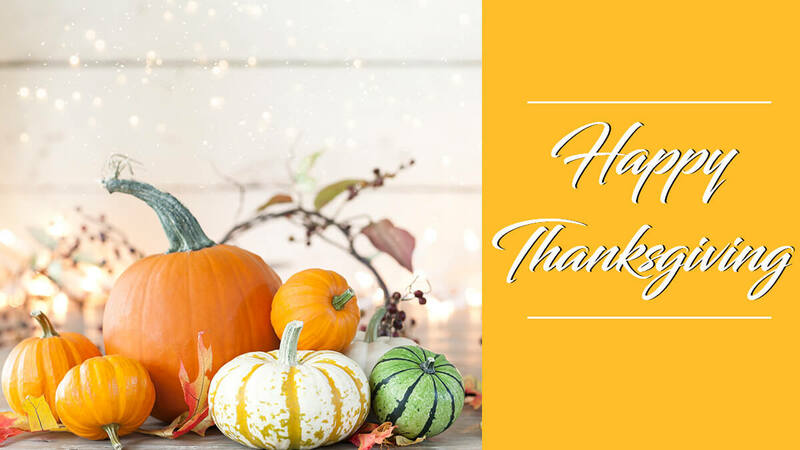 Thanksgiving is a special holiday because it's a time for reflection and the time to recognize all of the reasons you have to be grateful for. So we stopped to ask some of our Nurses what they are thankful for this Thanksgiving. I have been a nurse since 1990. First and foremost, I’m thankful I had the opportunity to be accepted into a nursing program just shortly after high school. I was just 22 years old when I landed my first nursing job. What an amazing year it was for me. I hope I was able to bless the lives of others as much as my patients have blessed my life. I’m thankful I have had the opportunity to connect and advocate for patients when they could possibly be at their lowest times in their lives. My patients depend on me to do what is right by them and for that I’m thankful I have had the opportunity to spend the last 28 years in the nursing profession which by the way has been named as the most trusted profession. I can particularly remember a patient that I took care of in my first year as a nurse. Let’s just call her “Haley”. Haley had been involved in a car wreck and suffered a closed head injury along with multiple fractures all over her body. She was in a coma for two months until the swelling in her brain subsided. I was able to care for Haley during her extended time in ICU and began to really know and of course like her family. We ALL took care of Haley and prayed for Haley. About 2 months after her accident, Haley decided it was time to wake up. What an amazing day that was. However, the work then began for Haley as she had to learn to walk and talk again as well as other activities of daily living. Her therapy consisted of strenuous and painful physical rehab. I can remember going to visit Haley once she was discharged from ICU in the physical rehabilitation unit. Haley and I had developed a deep connection with each other since she had spent almost 3 months in ICU. I recall one day during therapy, Haley informed me she was not going to give up and she would one day walk again. I told her I was proud of the hard work she was showing. Haley told me she was working hard and would never give up on her rehab because I never gave up on her when she was at her lowest point in her life just after her car accident. I think of Haley’s words often and realize I found strength in her words when I’m at my lowest. To “never give up”. I’m thankful for all the “Haleys” that I have had the opportunity to care for on my nursing journey I began 28 years ago. As I reflect on my 30+ years of being a nurse, I am grateful for the extraordinary privilege to share healing experiences with my patients and the people who love them. I appreciate the people I have met along my nursing journey; teammates, colleagues, mentors, and coaches who have supported and guided me throughout my career. Educating and touching the lives of students as they seek to enter this noble profession brings a deep sense of joy; and in my position with ATI, I am truly blessed to meet and interact with nurses around the country, each gratified to be members of this unique and special profession. Nursing is an incredible profession. 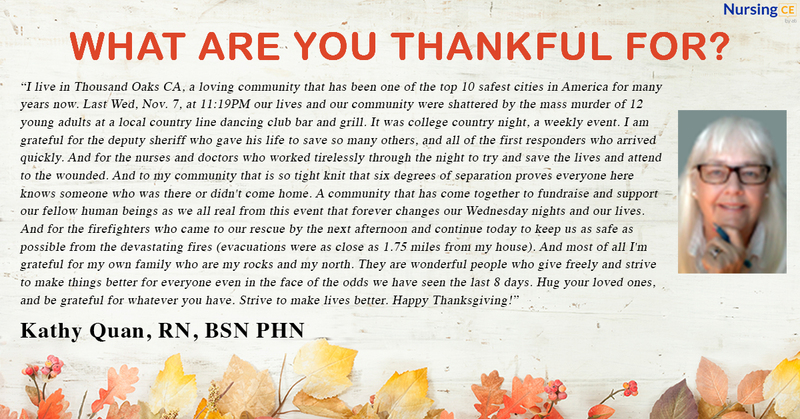 I am thankful for the time I am able to spend with my patients and their families; whether it is during the best time in their lives, or during the most challenging. Each moment a nurse spends with a patient is special. As a military nurse, serving in the US Navy, nursing has also given me the opportunity to travel the world and live in places I never dreamed possible. The diverse patient populations I have worked with around the world have also helped me grow as a nurse and as a person. 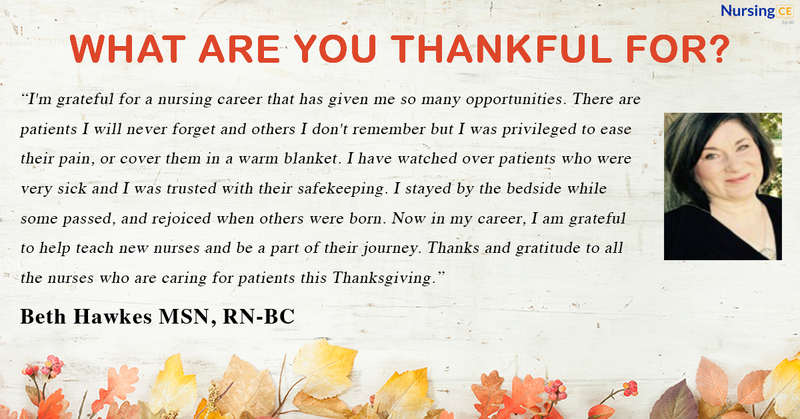 I'm grateful for a nursing career that has given me so many opportunities. There are patients I will never forget and others I don't remember but I was privileged to ease their pain, or cover them in a warm blanket. I have watched over patients who were very sick and I was trusted with their safekeeping. I stayed by the bedside while some passed, and rejoiced when others were born. Now in my career, I am grateful to help teach new nurses and be a part of their journey. 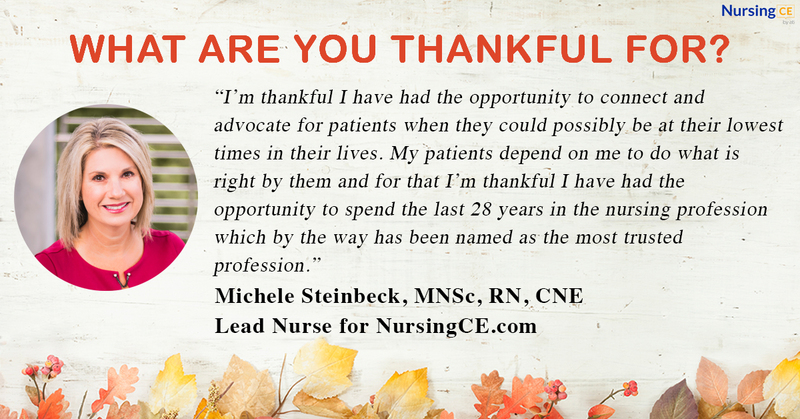 Thanks and gratitude to all the nurses who are caring for patients this Thanksgiving. As a nurse of 22 years, I'm grateful for having had a long and satisfying career that has afforded me many wonderful opportunities. At this time in my life, I'm very grateful to have created a lifestyle/workstyle that allows me to work from home as a successful nurse entrepreneur. Having a career that fits my needs is something that nursing has always allowed me to do, and I enjoy teaching others what I know as a holistic career coach for nurses and healthcare professionals. I live in Thousand Oaks CA, a loving community that has been one of the top 10 safest cities in America for many years now. Last Wed, Nov. 7, at 11:19PM our lives and our community were shattered by the mass murder of 12 young adults at a local country line dancing club bar and grill. It was college country night, a weekly event. I am grateful for the deputy sheriff who gave his life to save so many others, and all of the first responders who arrived quickly. And for the nurses and doctors who worked tirelessly through the night to try and save the lives and attend to the wounded. And to my community that is so tight knit that six degrees of separation proves everyone here knows someone who was there or didn't come home. A community that has come together to fundraise and support our fellow human beings as we all real from this event that forever changes our Wednesday nights and our lives. And for the firefighters who came to our rescue by the next afternoon and continue today to keep us as safe as possible from the devastating fires (evacuations were as close as 1.75 miles from my house). And most of all I'm grateful for my own family who are my rocks and my north. They are wonderful people who give freely and strive to make things better for everyone even in the face of the odds we have seen the last 8 days. Hug your loved ones, and be grateful for whatever you have. Strive to make lives better. Happy Thanksgiving! Remember that nursing is not only a career, but it is a gift that is shared with everyone. 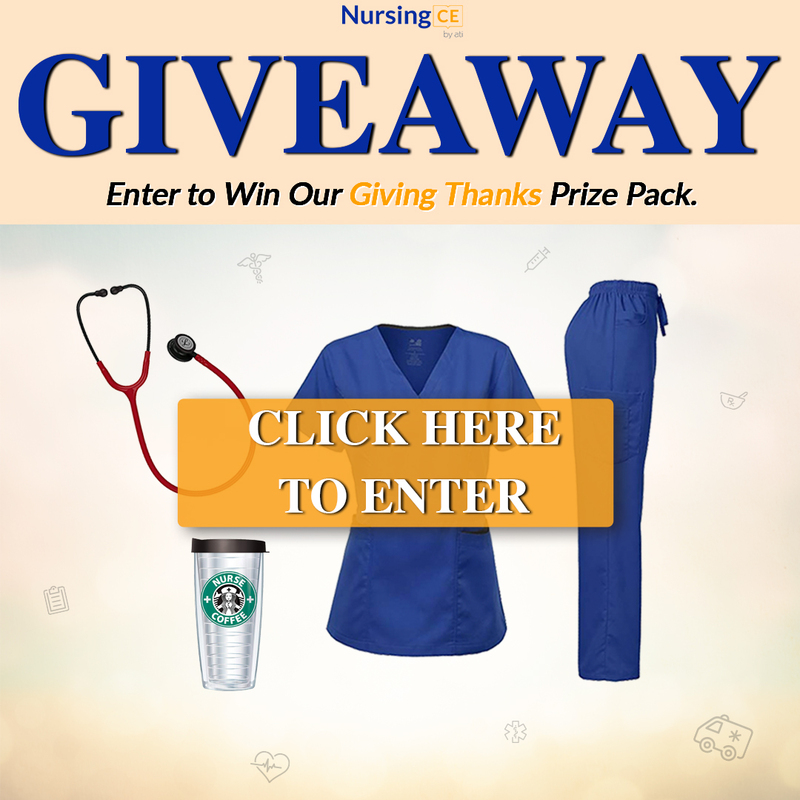 While you're here, don't forget to enter our Giving Thanks Giveaway.